Thinkorswim®, a product of the US brokerage company TD Ameritrade, is regarded as one of the best trading platforms worldwide. Thanks to the advanced platform, StockBrokers.com ranked TD Ameritrade as #1 for trading platforms and tools. Thinkorswim®’s rich features and highly-advanced functionalities like stock screeners that help users solve one of the most common problems – finding an all-in-one solution that combines everything needed in order to trade seamlessly. The following article will help you find out how to use thinkorswim® in a way that will unlock the entire potential of the platform. 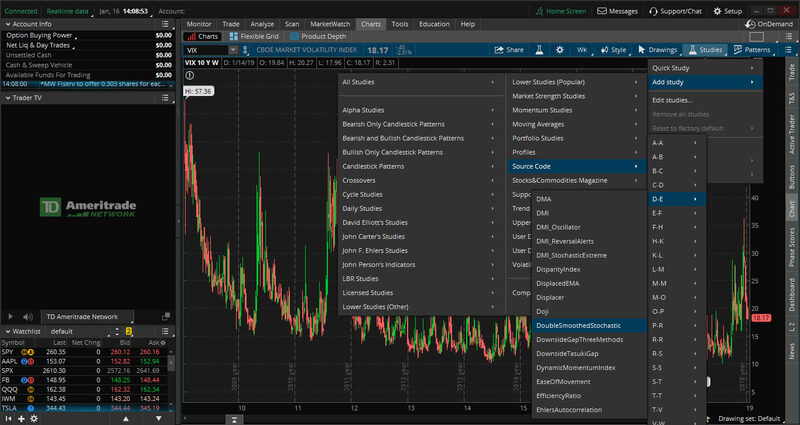 Our thinkorswim® review covers the platform features, traded instruments, costs, education and research tools, as well as other interesting facts and insights. The thinkorswim® guide has something for all types of users – for example, we will help beginner traders find out how to use the platform to trade commission-free instruments. There are also some valuable tips for advanced traders, focused on the in-depth features and research tools that thinkorswim® provides. ​Who Is ​thinkorswim Best For? Like TC2000, eSignal and NinjaTrader, Thinkorswim® is a downloadable program and requires local installation. But before you are able to use the program, you have to create an account with the broker. The account set-up is quick and smooth as the customer support staff are very helpful and responsive. After your account is verified and the software is installed, you can log-in easily with just your username and password. 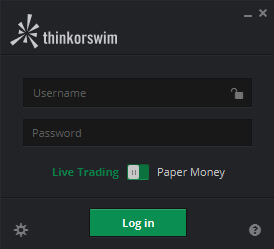 Bear in mind that under the username/password tabs, there is the option to choose whether you are using thinkorswim® for real trading or for demo trading (the PaperMoney option). After you have logged in the program you will find out how intuitive and easy-to-navigate thinkorswim® is, even for beginner users with no previous experience with trading programs. The working area of thinkorswim® is divided in two main segments – a sidebar in the left and a main window in the center of your trading station. The sidebar contains subtabs with relevant information. It is customizable and the user can add different gadgets - from account details tabs, message center and calculator, through watchlist and streaming features, to quick charts and quick quotes. Navigating the tabs on the main window, as well as all the subtabs can seem rather complicated for first-time users with no previous trading experience. However, after the first few sessions, users usually get familiar and start to feel comfortable using the powerful platform. It is worth noting the fact that, although all the features and the rich trading functionalities, thinkorswim®’s developers and designers have managed to do a wonderful job in fitting so much features and information in such a convenient and intuitive interface. When it comes to thinkorswim®’s trading features, it is reasonable to say that the platform offers one of the most complete trading services on the market. Thinkorswim® offers so much that even the most sophisticated traders won’t be disappointed. One of the main benefits of the platform is the chance to use the Federal Reserve Economic Data and receive constant updates and all that is for free. This, alongside with the fact that you can combine multiple fundamental and technical indicators (there are more than 400 technical indicators that you can use for advanced charting) brings you a whole new-level trading experience. More demanding traders can take advantage of rich backtesting features, custom alerts, sentiment scores, as well as automated trading. However, the thing that really makes thinkorswim® stand out from its competitors is the wide variety of technical studies – more than any other trading platform. Thinkorswim® has something to offer even for those who want to further customize the platform and its features by coding their own trading strategies. If you prefer trading via a propriety trading strategy, you can take advantage of thinkorswim®’s thinkScript® feature – a propriety coding language that allows you to transfer your trading methodology within the platform. ​On thinkorswim® you can trade a wide variety of instruments, such as stocks, bonds, mutual funds, ETFs, options, futures (as well as options on futures) and FX. One of the best thing about the platform is the fact that you can take advantage of more than 300 commission-free ETFs. That way, investors can trade easily, without having to pay huge commission fees. Apart from ETFs, you can trade some mutual funds free of charge as well. For more information about TD Ameritrade’s fee structure, head to our in-depth review. In a nutshell, the broker offers one of the most competitive pricing structures on the market. Add to that the fact that TD Ameritrade does not set any account minimum requirement and you have the reason why it is considered one of the best solutions for investors with small capital. But let’s get back to thinkorswim® and find out why the platform really stands out when it comes to pricing. Apart from the fact that it is free of charge, thinkorswim® provides access to the Federal Reserve Economic Data at no cost and you can use it even without funding your account. Bear in mind that the only other way to take advantage of this database is to have a Bloomberg Terminal which costs you north of $2 000 per month. ​Thinkorswim is free to use for any TD Ameritrade brokerage client. 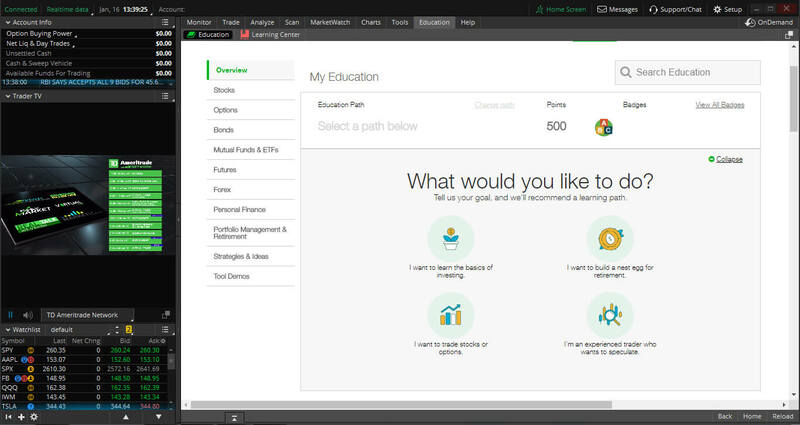 ​Education is in the heart of the thinkorswim® platform. The thinkorswim® Learning Center offers an extensive set of in-depth tutorials, how-to guides, and instructions on how to get the best out of the features and functions of the platform. All you have to do to take advantage of the huge knowledge base is to select your skill level. After that, you will receive automated suggestions about useful content, tailored to your personal needs and level of expertise. Your learning progress is tracked and awarded on the basis of some basic gamification principles. By achieving various milestones, you will be rewarded with points which you can later on exchange for attending online events or taking courses that interest you. What the platform does is basically encouraging you to learn, so that you can learn even more. Or in other words – to become a better trader. The education part of the platform has something to offer to users with various backgrounds – from experienced traders with years-long success, to beginners looking to make their first steps on financial markets. The webcasts and the in-person events, for example, are a wonderful opportunity for thinkorswim® users to gain access to valuable material from top industry experts​. Apart from that, the platform offers all types of courses that can help beginner traders learn the basics or build on their fundamentals to become a better version of themselves. If you want to find out more about the Learning Center, integrated in the platform, make sure to check its web version, available here. ​TD Ameritrade’s service is widely renowned for its timely and very professional customer support. According to StockBrokers.com, the platform’s customer service is the best in the industry. Apart from the human support, there is also the chatbot named Ted, that can help you with all sorts of issues – from account-specific information, to how to navigate the platform. ​Number of members: ​> 11 mn. ​The rich features and the variety of commission-free instruments, alongside with the extensive educational resources and the free-of-charge market data make it a great choice for all types of traders. The flexibility of the platform and the fact that it allows wide degrees of customization, according to the individual’s trading style and philosophy, make it a user-friendly, highly-functional and easy-to-navigate solution. Like TD Ameritrade says on its website – “When it comes to trading tools, thinkorswim® isn't just the average Joe platform. And in reality, it really does. In a nutshell, thinkorswim® is the best trading platform that you can currently find on the market. However, day trading for beginners with TD Ameritrade's brokerage account can become expensive, since the fee structure is only attractive for active traders trading high volume. Trading in increments of 100 stocks per trade can become costly since TD Ameritrade charges $6.95 flat-fee per trade right now. ​Instead of using TD Ameritrade's thinkorswim software, day trading beginners can take a closer look at Interactive Brokers free paper trade module and the best stock screener on this planet, Trade-Ideas A.I. Pro. If you wonder why Trade Ideas is the best stock screener available right now, then ​proceed reading the Trade Ideas review now.